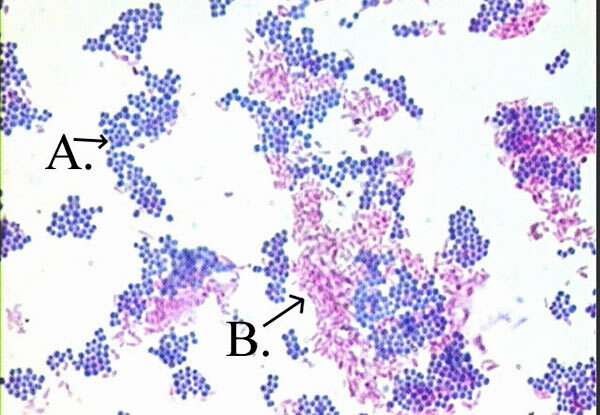 It is the differential staining techniques which was first developed by Ziehl and later on modified by Neelsen. So this method is also called Ziehl-Neelsen staining techniques. Neelsen in 1883 used Ziehl’s carbol-fuchsin and heat then decolorized with an acid alcohol, and counter stained with methylene blue. Thus Ziehl-Neelsen staining techniques was developed. The main aim of this staining is to differentiate bacteria into acid fast group and non-acid fast groups. This method is used for those microorganisms which are not staining by simple or Gram staining method, particularly the member of genus Mycobacterium, are resistant and can only be visualized by acid-fast staining. When the smear is stained with carbol fuchsin, it solubilizes the lipoidal material present in the Mycobacterial cell wall but by the application of heat, carbol fuchsin further penetrates through lipoidal wall and enters into cytoplasm. Then after all cell appears red. Then the smear is decolorized with decolorizing agent (3% HCL in 95% alcohol) but the acid fast cells are resistant due to the presence of large amount of lipoidal material in their cell wall which prevents the penetration of decolorizing solution. The non-acid fast organism lack the lipoidal material in their cell wall due to which they are easily decolorized, leaving the cells colorless. Then the smear is stained with counterstain, methylene blue. Only decolorized cells absorb the counter stain and take its color and appears blue while acid-fast cells retain the red color. Prepare bacterial smear on clean and grease free slide, using sterile technique. Allow smear to air dry and then heat fix. Alcohol-fixation: This is recommended when the smear has not been prepared from sodium hypochlorite (bleach) treated sputum and will not be stained immediately. M. tuberculosis is killed by bleach and during the staining process. Heat-fixation of untreated sputum will not kill M. tuberculosis whereas alcohol-fixation is bactericidal. Cover the smear with carbol fuchsin stain. Heat the stain until vapour just begins to rise (i.e. about 60 C). Do not overheat. Allow the heated stain to remain on the slide for 5 minutes. Heating the stain: Great care must be taken when heating the carbol fuchsin especially if staining is carried out over a tray or other container in which highly fiammable chemicals have collected from previous staining. Only a small fiame should be applied under the slides using an ignited swab previously dampened with a few drops of acid alcohol or 70% v/v ethanol or methanol. Do not use a large ethanol soaked swab because this is a fire risk. Wash off the stain with clean water. Note: When the tap water is not clean, wash the smear with filtered water or clean boiled rainwater. Cover the smear with 3% v/v acid alcohol for 5 minutes or until the smear is sufficiently decolorized, i.e. pale pink. Caution: Acid alcohol is fiammable, therefore use it with care well away from an open fiame. Wash well with clean water. Cover the smear with malachite green stain for 1–2 minutes, using the longer time when the smear is thin. Wipe the back of the slide clean, and place it in a draining rack for the smear to air-dry (do not blot dry). Examine the smear microscopically, using the 100 X oil immersion objective. 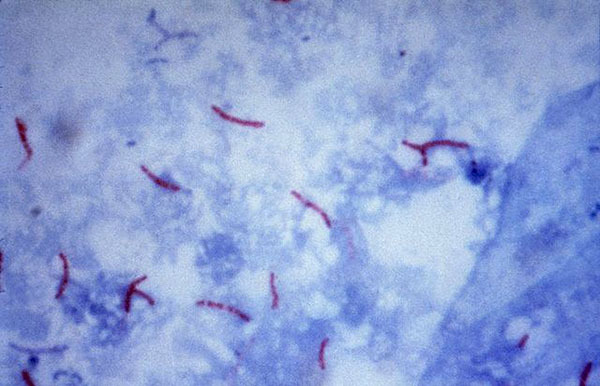 Mycobacterium tuberculosis visualization using the Ziehl–Neelsen stain. Acid-fast: Mycobacterium tuberculosis, Mycobacterium smegmatis. Is it necessary to tip off excess after rinsing with water? But you mean no need of malachites green when methylene blue is available ??? What happens if we overheat the slide? it is said that heating should be up to a point that there are fumes but boiling should be avoided .. why is this sir ? I am currently working on an unknown microbe project in my Micro class. I wanted to know what are the confirmation test for Mycobacterium smegmatis after acid-fast stain? But are there any precautions to dis experiment ?? you said counter stain is methylene blue, then why are you adding malachite green in the procedure. Is Cryptosporidium confused with Endolimax nana ? Am pascal studying medical lab in technical university Kumasi Ghana.my question is both carbol fuchsin and methylene blue are basic dyes, so what will happen if we use methylene blue as our primary stain? hey doin’ gud. & i don’t dis days of any sainin’ tecs.after many years of endavour now am floating, flyin’ fly ..fly fly fly up to z sky!!!!!!!!!!!!!!!!!!!!!!!!!!!!!!!!!!! I need clarification on the acid fast stain. First section says to use methylene blue, but next section says malachite green. What am I missing?? Is it for different specimens? Thanks much. Your website is awesome! U can use one of them either malachite green or 0.3%methylene blue. What is the concentration of Melachite green and carbol fuchsin in Zn staining ? it is so interesting part of microbiology and i like that because i am studying in this subject in 1st year asansol girls college and i want to be a microbiologist in my future.i am from west Bengal. The above discussion had been very much educative and it reminded me of my days in the university especially during my industrial training at Adamawa Hospital Yola, Nigeria. Microbiology is an intersting field of study that touches every aspect of human life. Great work Sagar,just take the corrections from James Adekeye and use the Monica Chessebrough. I used this book during my studies and it helped me so greatly. Hello, Thanks for the suggestion. Procedure has been corrected from the book of Monica Chessebrough. Great work Sagar. You only need to highlight how you prepare the smear. Try these reference materials Microbiology by Monica Chessebrough volume 1and 2. I believe it will be of great help as a microbiologist. Well done Mr. Aryal. Your explanation of the principle and procedure for Acid fast staining were basically correct. In your procedure however, the preparation of the smear needs not be sterile but aseptically done to prevent unwanted materials/organisms on your slide and assuring that only the specimen you intend to examine is on your slide. Hello, Thanks for the suggestion. Procedure has been corrected.